Okay, I have to admit that I’ve heard of this series quite often before I ever decided to pick it up. I wasn’t entirely sold on it, but then I heard Taran Matharu himself was coming to Belgium and the Netherlands so… Suddenly I just had to read them and see whether or not I liked them?! Firstly because international authors rarely come to my country, secondly because… well… it was the motivation I needed to see what certain people were raving about. Let’s start with the thing that impressed me most. The world-building. Absolutely exquisite, really. The history, the politics, the creatures, the overall descriptions of everything. I could totally imagine living in this world, this society and that is exactly what I love most about fantasy novels. Losing myself in another world. As for the creatures, we aren’t only getting humans. No. Dwarves, elves and even orcs are present as well. That’s not even mentioning their awesome sidekicks, by the way. The combination of all those creatures added so much to this story. Honestly, it could easily be compared to different races or beliefs in our own world. 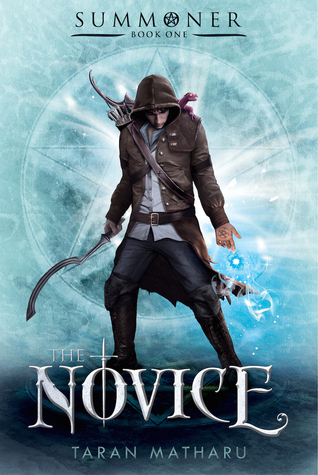 When I wasn’t that far in the book, I remember writing down all the Harry Potter-vibes I was getting from The Novice. Then, when I got to attend an interview with the author, Taran Matharu himself mentioned people comparing his Summoner-series to “a mix of Harry Potter, Lord of the Rings and Pokémon”. I almost wanted to shout “YES! THAT’S IT!” because that’s exactly the comparison I was looking for, really. All three these amazing worlds were merged into one, with added elements. For me, Matharu’s creativity especially shines through the magical aspect of the book. But not only that. His writing! It pulled me in right at the bat. I wasn’t bored for one second, flew through the pages and could hardly believe it when I was done. The action was so well-written that it made me want to flip page after page after page. Safe to say the story has a pretty decent pace as well! Loving all the characters definitely helped me read so quickly as well. I was – and still am – so curious to see where Fletcher’s friendships with Othello – a dwarf – and Sylvia – an elf – were going to end up. I’m getting some serious “best trio”-vibes from those, to be honest. Not to mention their awesome sidekicks! The ending though. Such a cliff hanger. Seriously. I have the sequel already, but I haven’t had time yet to pick it up. I don’t even know why. I should just make time, right? Conclusion of this review: I absolutely love the world Matharu created and I really want get back to it! I didn’t even have one thing to fault and that’s saying plenty?! Have you read this series? Planning on it? What are your first thoughts when you hear of a world where Harry Potter, Lord of the Rings and Pokémon has been merged into one? ‹ PreviousWHAT NOW? 1K FOLLOWERS?! 1 YEAR BLOGIVERSARY? LET’S PARTYYYYY. Great world building mixed with great writing??? I’m curious. Now, I have to make room for this one in my reading time. Thanks for your review Kathy. My fiance picked this book up at Barnes & Noble in April, but neither of us has read it…yet. Based on this review, we should probably pick it up soon. Haha, nice! I got my copy signed so I simply HAD to read it before the signing. Although I still haven’t read the sequel yet.. That’s the sequel-sickness right there. You sold me with just the title of your post alone. That’s what I was aiming for! Whoooooa LOTR, HP, Pokemon mash up??? I’m sold! I’m so glad you reviewed this. I’m interested now.